Maybe you waited until the last minute to plan your Thanksgiving menu, or you're still looking for the perfect side dish to bring to that potluck. Perhaps you need some new drink ideas to survive time with your relatives, or maybe you just want to forget about the holiday and cook something -- anything -- that isn't turkey. 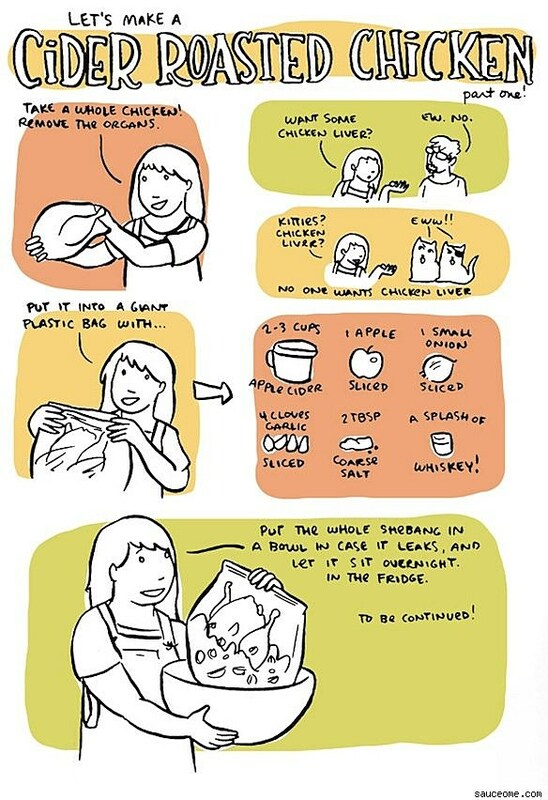 Whatever your food or beverage problem, webcomics come to your rescue with irreverent and easy-to-follow recipes to help you survive Turkey Day. Note: The Thanksgiving Alone can be applied liberally even when you merely wish you were spending Thanksgiving alone. If you're still looking to satisfy your sweet tooth, try his walnut maple scones, peach cobbler or lemon butter cookies. And for less-Thanksgivingy savory options, Drawn Butter offers everything from chicken and dumplings to French onion soup, and how to make essentials like chicken, beef and shrimp stocks. If your Thanksgiving tastes run more liquid than solid, there are drink recipes aplenty. In addition to Dorothy Gambrell's Thanksgiving Alone, you could test out Dr. McNinja creator Chris Hastings' ginger cocktails, A Softer World co-creator Emily Horne's Noonday Reviver (perfect for the morning after) or Sarah Becan's favorite mint julep. Drawn Butter takes the classic route, with advice on mixing martinis, sazeracs, whiskey sours, Bloody Marys and milk punch. Cooking Comically recommends spiking the whipped cream with a healthy dose of bourbon to keep your blood alcohol level up all through dessert. Of course, Thanksgiving isn't just for stuffing your face and drinking until you're too numb to argue about politics. It's also a time to reflect on the things we're grateful for and remember those who could use a little extra help during the holiday season. 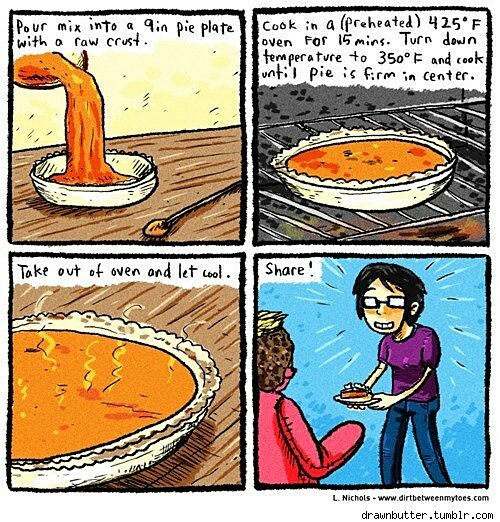 With that in mind, TGT Media released Webcomics: What's Cooking? earlier this fall. The book features recipe comics by more than 50 cartoonists, including Caanan Grall (Max Overacts), David Reddick (Legend of Bill), Eben Burgoon and Dan Bethel (Eben07), Lora Innes (The Dreamer) and Emy Bitner (Trying Human), and the proceeds go to food banks in the United States and Canad. So you can sample the talents (and recipes) of a variety of cartoonists while helping to feed families in need. Now I just need the perfect comic to describe that most delicious crime against nature, the turducken. It takes the starring role at my family's Thanksgiving dinners, and I have a perverse desire to see a cartoonist take a crack at all that butchering. 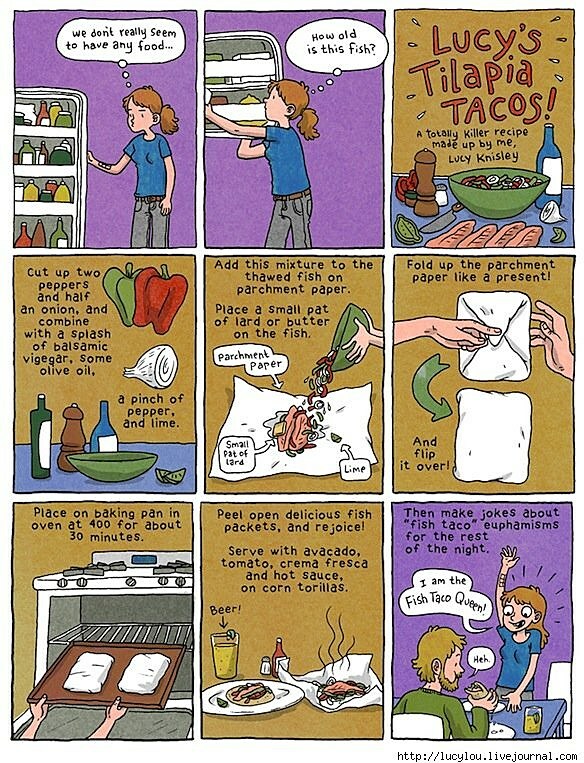 Do you have any comic recipes you swear by? What's going on your table this Thanksgiving? 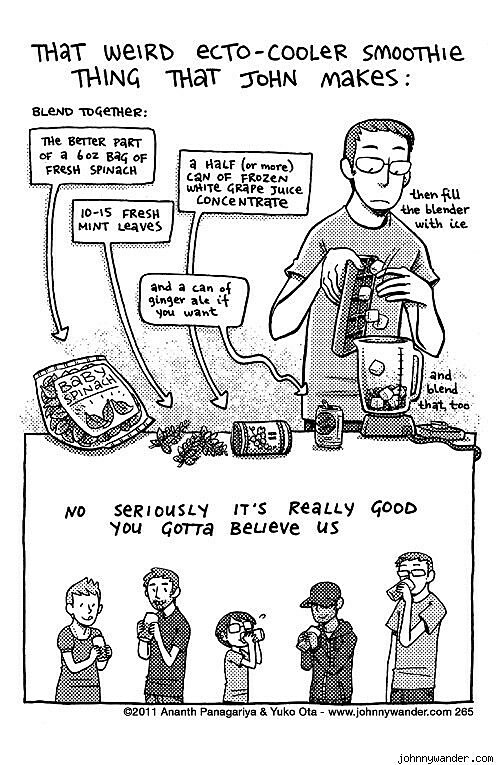 And has anyone dared to try the Ecto-Cooler smoothie?